It is with extreme appreciation and gratitude, that I thank my incredible classmates for being there last night at our 40th CHS class reunion. I am so proud to be a REDMAN. I am convinced the older we get, the better we get - as was evidenced last night!! PLEASE SHARE PICTURES IF YOU HAVE THEM!! I will be posting them shortly...! To Cyndi Woodbury Gilbert - for her beautiful HOME, the gorgeous night air, and the delicious PRIME RIB and CRAB!! I watched her husband over there furiously cooking, and just thought - what a good man :) The beautiful vista view from the back of her yard never ceases to amaze me. I have a newfound respect for the years and years of reunions she has put on, in our behalf! To Sally Hunter Jensen - who I know first hand, spent an immense and exhaustive amount of time locating CLASSMATES - and not just finding them, but going the extra mile to reconnect with them again after so many years. She was on a mission to not only find, but make a difference - and that she did, most certainly. To Janice Bickmore Warner - for the beautiful MEMORIAL TABLE of our deceased classmates. (who will always be a huge part of us and our high school memory), and for the MEMORABILIA TABLE - so fun! Thank you to those who contributed! Also, to her husband, Byron, who was our PHOTOGRAPHER that night. To Michelle Lyman Johnson - for the 1970's MUSIC! I am convinced our era was the greatest music of all time! It was so fun to listen to again! And for organizing the great RAFFLE! Thanks to those who contributed items to raffle off! To Rachelle Thorley Murray - for the great QUESTION BOARDS that were strategically placed throughout the crowds. It was a great ice-breaker, and her thought-provoking questions for us were so fun for all to read. Most importantly - to EACH OF YOU - for making our CEDAR HIGH SCHOOL - BICENTENNIAL CLASS of 1976 - the most fantastic class of all time! Thank you for being my classmates and what you have given me, personally. I looked around last night and reflectively remembered each of you with great joy, growing up in Cedar City. I was touched at those who came from near and far - and many from out of state, to attend! Wow! Our class website - www.cedar76.com, will continue and we will keep you updated on any class news! Look forward to reuniting again in 2021! Until then, be well and be safe. Hi Friends! If you have some CHS memorabilia you would like to display at the reunion, please bring it! We will have a table set up for a "Walk Down Memory Lane." It can be anything Cedar High! So excited to see you all there! Here it is! Information for our 40th High School Class Reunion of the Class of 1976 is listed below! Please join fellow classmates as we catch up and reminisce together in a beautiful outdoor and informal setting. Please register early and plan to attend! 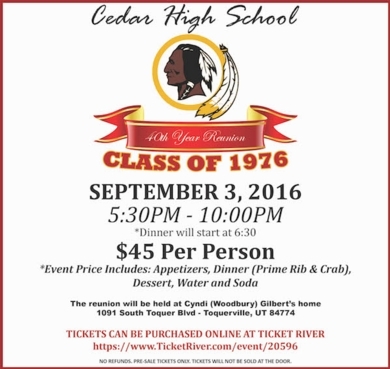 We also have a Facebook page - "Cedar City High School Class of 1976"
40th High School Class Reunion! The reunion will be held at Cyndi (Woodbury) Gilbert's home in Toquerville, Utah, on Saturday, September 3rd, 2016 (Labor Day weekend)!! If you haven't already registered yourself on this Class Creator site, (www.cedar76.com) please do so! We want to find as many "missing" class members as we possibly can. The vast majority of our class is still in limbo. In the "Missing Classmates" tab above, each one of you are listed there until your account is activated. Please refer to the "First Time Visitors" tab (above center) for instructions on how to step-by-step set your own account up. Navigate this website once you are signed up. Notice that there are sections for you send emails to one another, update your personal information and tell us all where and what you have been doing all of these years, and many other tools to connect to other friends from our class. Your private information is only accessible to those who sign in. We would love to hear about it! Welcome Cedar High Redmen Class of 1976! Cyndi Woodbury Gilbert has graciously offered her beautiful home and backyard setting in Toquerville, Utah to us again, to linger and get reacquainted that evening (to those who attended the last reunion, you know what I mean!). Much more information is to follow!! We just wanted to keep you in the loop and mark your calendars, so that you'll be sure to attend! There are many of us missing from this page! Please help us to locate missing classmates, whose names and emails are not present on this list. You can reply by emailing me (Vicki Mullett Warner), or Cyndi Woodbury Gilbert, co-administrator to this page. In the "Missing Classmates" tab above, each one of you are listed there until your account is activated. Please refer to the "First Time Visitors" tab (above center), for instructions on how to step-by-step set your own account up. from the best high school class ever - 1976!